There are a host of different leadership styles that a manager, business owner, or group leader may choose to use today. For instance, there is the autocratic option, which is centered around the boss. This method may not mesh well with every organization though. It allows the person in charge to make decisions without consulting anyone else. Then, he or she passes along the orders and expects others to follow them as directed. Meanwhile, laissez-faire leadership is a possibility too. Employees or group members are given authority and allowed to work with little to no interference. Like the autocratic approach, this one may not be suitable for everyone either. It is often thought of as being an ineffective and unsatisfying management style. Luckily, there are plenty of choices though, so persons just have to find the one that works best. For many, the answer to the dilemma is compassionate leadership, which this Technalink post will discuss. When using this strategy, leaders look out for the best interests of others within the group. They regularly show compassion, hence the name compassionate leadership. Also, the persons are transparent and open, authentic, and they are focused on making connections. In doing these things, the individual enables and empowers members to put their best foot forward. The leader gets the most out of people by treating them the way that he or she wants to be treated. A lot of people high up on the totem pole are fearful of utilizing such an approach. They feel as if employees or group members will fail to show respect and just walk all over them. These individuals are afraid that productivity will slip too. However, this is usually not the case. The others are typically more than happy to work together and achieve common goals when the leader is compassionate and understanding. 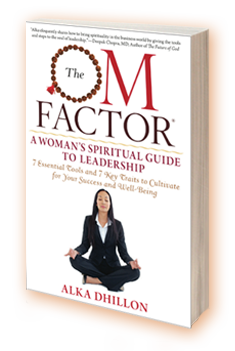 The OM Factor: A Women’s Spiritual Guide To Leadership is an exceptional piece written by Alka Dhillon. It discusses meditation and other tools that people can use in their careers as well as life in general. The novel can assist a person in learning how to become in control, calm, focused, and more. Allow it to help you bring compassion into your workplace.